Even though our home school has never officially used Handwriting Without Tears for our handwriting program, I am definitely familiar with the small slate and wet-dry-try method of learning letter formations that are a hallmark of the method-- I used this technique to help Ben when he was four or so. 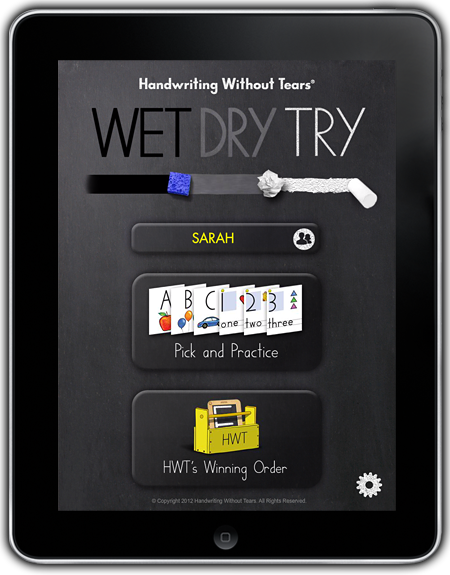 Well, welcome to the 21st Century: HWT’s new app -- Wet-Dry-Try App ($4.99 in both iTunes Store and Google Play). No matter which way you use this, your child has to complete the wet-dry-dry procedure on each letter three times before your student is awarded a colored “picture” that is taped to their electronic slate. On the first try, a pleasant voice guided Levi through each of the steps – tracing the letter with a “sponge” which blackens the letter on the chalkboard. Then the voice tells him to use a “tissue” to dry the letter, and finally Levi was given a piece of chalk to re-write the letter. The graphics on the app show exactly where to start forming the letter. On the second try, the sponge-tissue-chalk flashes to remind the child where to start forming the letter on the chalk board. On the third and final try, there are no clues on where to start making the letter. There are several adjustments you can make when you log onto the app. You can add up to four players. You can turn the music on or off as well as turning off voice instruction and sound effects. And you can “lock” your child on a certain star level if they need more practice. There is a nice FAQ section on the app’s website. How we used it: We haven’t really used a handwriting program much this year – I taught Levi cursive in first grade and he’s been using it in spelling and other subjects fairly consistently. But I noticed that he was having trouble with correct print formation, so we used this app to give him a little bump up. I’m pleased to say that he is more consistently using “Frog Jump Capitals” and they are a much more legible. I then switched to some basic copywork with paper and pencil using HWT’s letter style. He is definitely doing better shaping his capitals and lower case b/d’s than before. Levi showing off all his letters from The Winning Order. 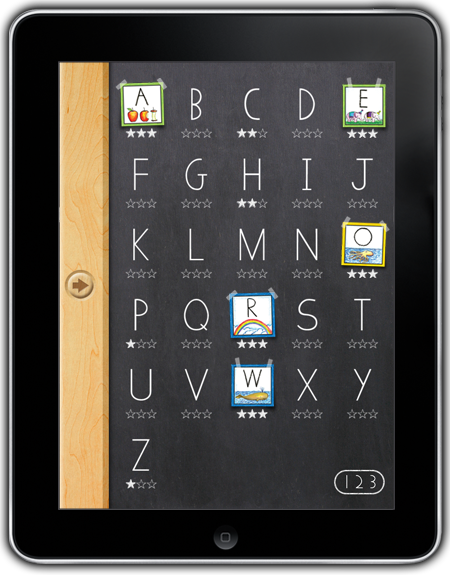 My recommendations & thoughts: I think this is a good "version 1.0" app for those with young children - or children with fine motor needs -- who are wanting to supplement their traditional HWT program. 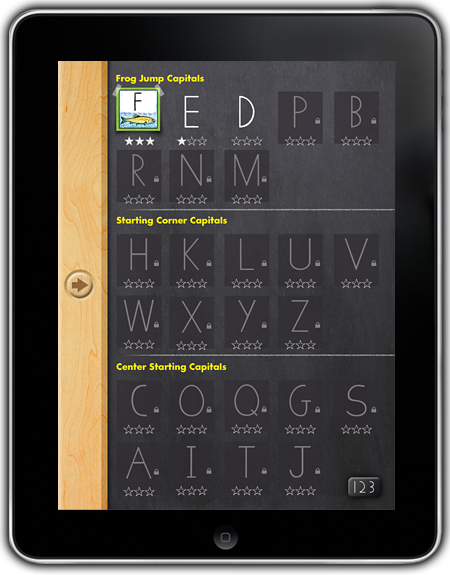 If I was just starting with HWT with my preKer or kindergartner, I would definitely want this app! 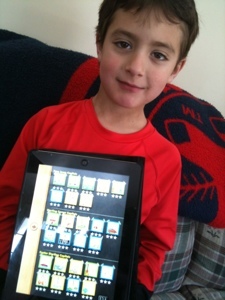 My 7 year old liked it – and I’m sure that because it was an iPad app, he liked it even more! It was a fun tool to practice a skill that can become tedious. But he finished using the app within about two weeks at the most. I really hope the HWT people will add lower case and cursive to the app! Then I think it would be a great supplement for a wider range of ages who need some reinforcement of writing skills while sitting in the dentist’s waiting room or driving to grandma’s house. In addition to the app, some Crew members reviewed Handwriting Without Tear’s new Common Core aligned K-3rd grade handwriting programs. To read what these homeschool, blogging moms thought of these products, please click on the banner below. Enjoyed your review. Thank you!